Grass Lake, Mich. – The 2016 USEF Para-Equestrian Dressage National Championships sponsored by Deloitte and Selection Event for the Rio 2016 Paralympic Games wrapped up Sunday with Grade Ib athlete Sydney Collier and Western Rose being crowned National Champions in the High Performance Division. 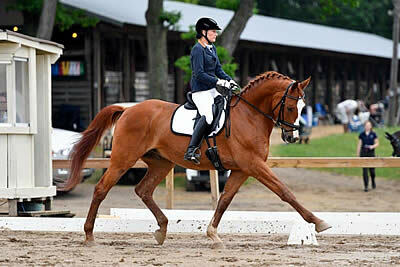 Grade III athlete Pamela Hardin and Quaterjack earned top honors in the National Division. Sunday’s Freestyle Tests accounted for the final 20% of the overall championship scores with the first 80% percent coming equally from Friday’s Team Test and Saturday’s Individual Test. Heading into the final day of competition, the top of the High Performance leaderboard was extremely close with the top five all sitting within two percentage points of each other. The Freestyles proved very influential, with the athletes turning in high-quality performances under inclement weather conditions in front of the ground jury of Kathy Amos-Jacob (FRA), Carlos Lopes (POR), and Kristi Wysocki (USA). Collier (Ann Arbor, Mich.) and Wesley Dunham’s 2003 Oldenburg mare, Western Rose, began their quest for National Championship honors with a solid Team Test score of 70.867%. In Saturday’s Individual Test, the pair marked the highest score of the day across all grades, a 73.678%. Capping off a successful weekend with the Freestyle Test, featuring instrumental versions of Phillip Phillip’s “Home” and One Direction’s “Secrets”, the pair scored a 73.167% and secured the Grade Ib National Championship and overall High Performance Division titles. “It was an incredible [Freestyle] test. I stayed with my music and both of the halts were squares, which I am so proud of. Our medium walks felt good, even though I didn’t push her as much with the muddy footing. Overall, my accuracy was spot-on. This was a great way to start the summer and an exciting start to a journey. It is such an honor competing with so many talented athletes and their horses. I want to say a big thank you to all of my sponsors; I could not be here without them,” said a pleased Collier. Collier was also Reserve National Champion in the Grade Ib High Performance Division with her own Wentworth, a 2003 Hanoverian gelding. Earning the highest Freestyle score of the day with a 75.833%, Angela Peavy (Avon, Conn.) and Rebecca Reno and Heather Blitz’s Lancelot Warrior, a 2002 Hanoverian gelding, earned the High Performance Division Reserve National Champion title and were the Grade III National Champions. The pair went from strength to strength this weekend, improving its scores each day. They earned a Team Test score of 69.693% and an Individual Test score of 72.967%. Rounding out the top three overall in the High Performance Division was Kate Shoemaker (Peoria, Ariz.) and Solitaer 40, Craig Kate and Denna Shoemaker’s 2007 Hanoverian stallion. As the Grade III Reserve Champions, they scored 72.193% in the Team Test, 70.041% in the Individual Test, and 71.917% in the Freestyle Test. Maintaining their overnight lead, Hardin (Evans, Ga.) and Kara Hardin, Kasey Hardin, Rachel Bryant, and her own 2005 Brandenburg gelding, Quaterjack, performed another brilliant test to end their weekend. In day one’s Grade III Team Test, the pair worked through initial nerves to score a 67.675%. They improved greatly on day two, scoring a 70.203% in the Individual Test, moving them into the lead, overall. The pair performed an energetic and expressive Freestyle to music from the movie Kung-Fu Panda and the video game Dragon Warrior to earn a score of 72.417%. “I couldn’t have asked for more from that horse. He rises to the occasion every time. Everything can go wrong at a show and he takes it all in stride. Nothing fazes him,” said Hardin. “The test went well; I love the extended trot [in the Freestyle] down the long side – we are able to really go for it.” Hardin also earned the Grade III National Champion title. Laurietta Oakleaf (Malvern, Pa.) and her own and Laura McGinnis’ 2004 Friesian stallion, Niekele fan Busenitz, or Nikki, finished the weekend as the Grade Ib National Champions and Reserve National Champions, overall, in the National Division. The pair led the division on day one with a Team Test score of 68.200%. They posted an Individual Test score of 66.724% and earned a score of 68.667% in the Freestyle. Earning the third-place position overall in the division was Grade IV National Champion, Mary Jordan (Wells, Maine) and Vinceremos Therapeutic Riding Center’s Rubicon 75, a 2005 Oldenburg gelding. The pair scored a 63.611% in the Team Test, a 66.905% in the Individual Test, and a 67.583% in the Freestyle. U.S. Paralympic Dressage Team selection rankings will be based on 50% of a combination’s overall performance in the Selection Event and 50% on the combined overall score from its best two CPEDI3* events taking place January 1, 2015 – May 16, 2016. The selection procedures also include discretionary criteria. Of the 11 athletes competing this weekend, nine will look to secure a position on the four-member 2016 U.S. Paralympic Dressage Team, which will be announced at a later date. All nominations to the 2016 U.S. Paralympic Dressage Team are subject to approval by the United States Olympic Committee and the USEF. Para-dressage competition at the Paralympic Games takes place September 11-16, 2016 in Rio de Janeiro, Brazil.